My alarm went off at 0630. I knew I was going to take forever getting everything organized and ready for my hike, so I didn’t lolligag around in bed. The AC last night kept oscillating between ice cold air and a moist breeze. Oh well, I appreciate the fact that I had it at all. 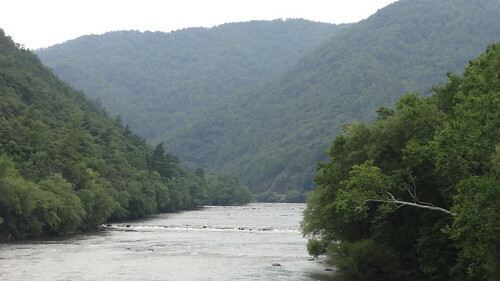 Once I reorganized everything around in my truck, again, I set off for the public parking lot, and was stepping off across the French Broad River. At the end of the bridge, the trail switches back beneath it, so you have to hop over the guard rail. There were several double blazes indicating this, but having read it in the guidebook was a help too. The trail went past a field and parking area and past a few houses. I noticed one of them had a rather large Confederate flag flying. That’s the 4th or 5th one I’ve seen so far; they seem to be a lot more prevalent here than I’m used to. Oh well. Just one more thing to be aware of. The trail paralleled the river, and I stumbled upon several campsites, some occupied. Across the river I could hear country music playing at another, larger campsite. It irked me to hear it all the way over here, when the morning is supposed to serene and calm. That, passing the Confederate flags, and walking along the river bank with random fire rings and tents around gave me a weird feeling- not really uneasy, more like unsettled. I didn’t care much for it and was happy to start the incline up Lover’s Leap. My alarm rang at 0615. It was a rather peaceful number, entitled “Dawn chorus alarm”. Figured it fit the occasion, and wasn’t harsh enough to jar me awake in a panic. Maybe it was a little too peaceful; I laid back down and closed my eyes for a few more minutes. Last night got just a little chilly, not enough to keep me awake but enough to make me glad I spent the money on the liner for my sleeping bag. After I packed up and hit the privy, I set out for my destination- Hot Springs. Right around 13 miles. Yes- I’m going to do it. There was a liter and a half of water in my Platypus and the springs were ample according to the guide, so water wasn’t a concern. The trail descended down Kale Gap (mi 261.5, elev 3714′), and it was full of undergrowth, some as high as my head at times. There seems to be a few particular plants that grow along the Southern Appalachians that get out of control here. It was the same type of brush encountered going up Roan at Beartown Mtn. 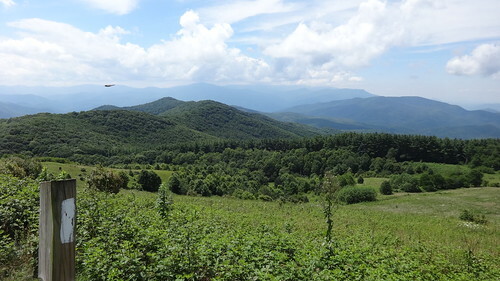 At Catpen Gap (mi 262.2, elev 4135′) there was a meadow off trail that apparently had a good view of Max Patch, but I didn’t venture out as I was unaware until later on in the day when I read the guidebook. My main priority was to get a GPS signal, which I finally did get at the edge of the clearing. The ascent up Bluff Mtn (mi 263.2, elev 4686′) wasn’t too bad since my legs were fresh, and there wasn’t a heavy load of water occupying my pack. A rather large and flat campsite was near the summit, with space for at least six or seven tents and with a big fire ring it seemed like a great place to camp out. Breakfast at the summit was some dried fruit and a Kind bar. Kind bars are awesome! My favorites are the cranberry & almond and the vanilla blueberry. They tend to get sticky but are oh so good. There was a spring about 50m down from the summit that unfortunately had a lot of sediment in it- the only place to fit the mouth of my bottle in wasn’t in the best place, and I’d stirred the water up trying to get it situated. Oh well. Filter it through a bandana and drive on. An old Army buddy of mine (and fellow jumpmaster extraordinaire) was going to shuttle me to Max Patch from Hot Springs to start my next section hike. Rolled into town around 11:00. It’s smaller than Damascus- I’m really getting a taste of small-town America, even if it’s a haven for hikers and motorcyclists. As I was coming down the hill on US 25/70, I passed underneath a footbridge carrying the AT, marked with two signs. Very nice. Wonder if I’ll be crossing that footbridge on this trip! My first mandatory stop was to the Bluff Mountain Outfitters. They have a pretty good selection of clothes, gear, and the requisite souvenirs, but where they really shine is the food- not just freeze-dried Mountain House offerings, but organic choices, fruit bars out the wazoo, nuts, jerky and cane sugar soda (score!). It all seemed a little bohemian and “hippie-ish”, but that wasn’t a bad thing. I snagged a couple cool stickers and bought a sleeping bag liner, worrying that wearing shorts and a t-shirt in my (Army issue) patrol sleeping bag may chill me a bit (temps that night were forecast to be right around 48 at elevation). The town doesn’t have a supermarket, only a Dollar General, so I’m sure they make a good bit of coin selling foodstuffs. The folks there were friendly, just as in Damascus. Anyway, I met Jeremy at the public parking lot (which is nothing more than a gravel lot behind a restaurant and a small cottage-styled motel/hostel), grabbed my bag, and we were off. We spent the ride catching up on the last 12-13 years, and after a wrong turn or two, arrived at the Max Patch parking area, and I was off. The walk up to Max Patch wasn’t too bad. The summit provided very nice views of the Smokies to the southwest and Mt. Mitchell to the east. For some strange reason though, I wasn’t blown away by the view. 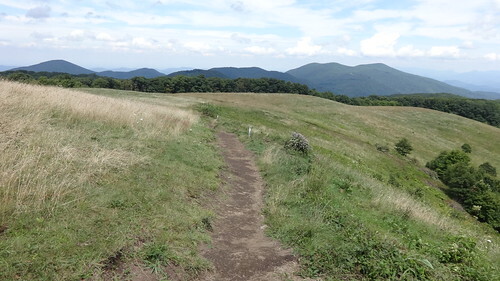 Don’t get me wrong, the summit of Max Patch is beautiful, but (to me) not as beautiful as the Roan Highlands, Little Hump, and Hump Mountain were. It must have had something to do with a strenuous climb to see the Humps, and barely any effort to see Max Patch. Who knows? Reached the top in 20 minutes and spent another 10 fooling around with my camera. AT: short for “Appalachian Trail”. Shelters (also called huts & lean-tos): A three or four sided wooden or stone building, spaced out usually between 5-15 miles apart. Most are near a water source, and some have a privy. Hiker Midnight: when the sun goes down, regardless of time of day, unofficial “quiet hours” should be observed. NOBO: Northbound (in a direction from Springer towards Katahdin). Trail north isn’t always compass north. White Blazes: 2″ x 6″ vertical white rectangles that are placed at eye height on trees and other objects, in both directions, to mark the official route of the Trail. Blue blaze: Spur trails off the AT to views, shelters, water sources etc. Double blaze: Two blazes, one above the other as an indication of an imminent turn or intersection in the trail. Hostel: An establishment along the trail (or nearby) that has bunks, showers, and sometimes cooking and maildrops, for AT hikers. Some are nicer than others. Register: A log book normally found at a trail shelter or a trail head or upon entering officially designated Wilderness areas. The original intent was for hikers to sign in so a searcher needing to find a lost hiker could tell where they last were. Some hikers often post hilarious entries or illustrations in the shelter books. 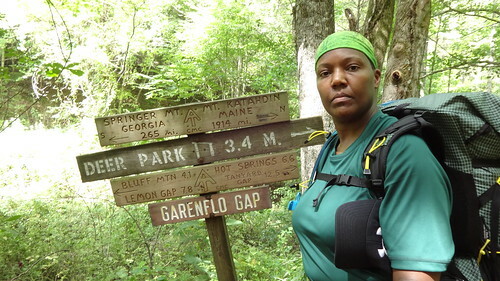 Section hiker: is a person who is attempting to complete the entire Appalachian Trail by doing a series of section hikes over a period of time. Slackpacking: getting someone to carry your main pack any distance along the trail for you, enabling you to carry a smaller backpack and hike faster. Stealth camping: a manner of camping where there is no indication that you are there, and no trace of your being there is left when you’ve left. There are countless “established” (but unofficial) sites all along the trail. Stile: Steps or passageway constructed over or through a fence to allow people, but not livestock, to pass. Switch Back: A turn that takes the hiker 180 degrees in the oposite direction. Trail Magic: Any unexpected food , water, or other beverages provided by other people on the trail. This can range from a small cooler by a trailhead to a full blown cookout (“Hiker feed”). Trail Magic is always welcomed. ALWAYS. Yogi: “letting” food be offered cheerfully by strangers without actually asking them directly. Think Yogi Bear. When I use a mile marker (i.e mi 483.2) that’s the mileage NOBO from the AT’s southern terminus on Springer Mountain, as per the ALDHA’s (Appalachian Long Distance Hiking Association) AT Thru-Hiker’s Companion. Finally, there may will be times when I slip up and use 24 hour military time. It just comes naturally for me, and writing “a.m.” and “p.m.” all the time is a PITA. Other hiking slang and terms can be found here.